iPhone 5 Repair Surrey. 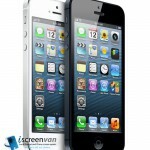 Complete Screen supply and fit for just £75 when booked on-line! This is a same day at your home or work local service. There is no need to send your phone in the post to an anonymous business or arrange expensive reconditioned swaps with Apple. Apple currently charge £179 for iPhone reconditioned swaps. This process involves arranging an appointment with an Apple store which takes a few days and in the process you will donate your old phone and also your data and pictures. If you would prefer to go to an Apple store then we would strongly advise you take backup your phone to iTunes and then restore your backup a few days later when the reconditioned phone arrives. You will then need to manually set all saved passwords on the reconditioned phone, this includes: email account information, safari automatic logins and app logins. With our iPhone 5 repair service you can keep your existing phone along with all of your current data, email and app settings. All of this without any hassle and within 20 minutes of our engineer arriving directly to your door! We can repair almost any iPhone 5 faults including iPhone 5 screen repair, battery, camera repair, and speaker repair. Amazing service, cannot recommend enough. Friendly and helpful and good value. Fantastic service. I choose my time and the chap was round here in a shot. Quick 10 minutes later phone has a brand new screen paid via Credit Card and for a fantastic price of just £65!!! Flippin Fantastic!